Take Vanilla ice cream & some round slices of fresh orange. 1. Place the rings of fresh orange at the base of bowl. 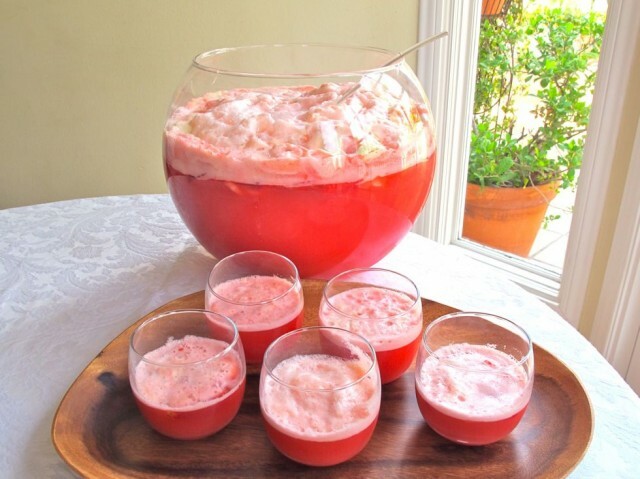 Pour all the three liquids in a big punch bowl just before serving starting with juice first. 2. Add lot of ice cubes. 3. Add 2-3 scoops of vanilla ice cream. 4. Stir a little & serve your guests this frothy orange tingling drink. As the ice cream melts it becomes frothier & creamier. Kids love it because the sherbet foams and melts into the fruit punch. Strawberries: 10-12, cleaned & sliced thin. 1. Place the fruits at the base of the big punch bowl. 2. Pour the fruit punch over the fruits. 4. Pour lemon soda(sprite) slowly & stir lightly with a big plastic or wooden serving spoon. Foam will rise above to give a frothy appearance. 5. 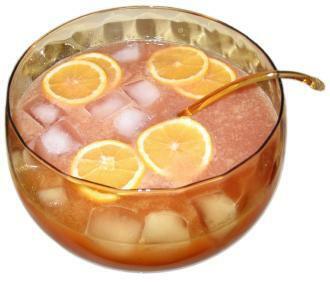 Serve punch in glasses with few fruit pieces and creamy frothy sherbet. Note: As sherbet ice cream melts, the punch will become thicker, richer, and more delicious. here is my absolutely delicious, tingling, frothy non-alcoholic punch for both young and old!! It is a cocktail of soda & juice, slightly sweet with tinge of sourness. It will surely be loved by all your guests at your party.